How to play the new Priest deck to hit the meta! Our Wall Priest deck list guide features the best Rastakhan deck list for Season 61 of Hearthstone (April 2019). 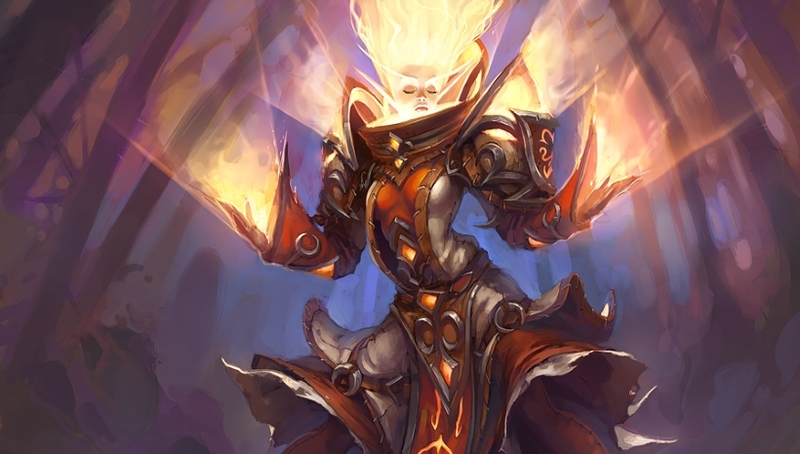 Our Wall Priest guide also contains Mulligan advice, card combos and strategy tips. Wall Priest is a new Hearthstone deck to hit the meta in the wake of the recent balancing patch, and owes a great deal to the OTK Priest format that's built around the Topsy Turvy card. The idea with this deck, however, is to put together a stupendously sticky board of taunt minions one after another, one of which will eventually become your Divine Spirit / Inner Fire combo target. To keep those taunt minions rolling, you're also taking advantage of elements from the Resurrect Priest archetype, with cards like Eternal Servitude and Lesser Diamond Spellstone playing their part. Another notable card in this deck is Master Oakheart - a big power play when you see some of the targets available in the deck list below. In the first edition of our Wall Priest guide, we've highlighted the strongest version of the deck that you can pilot right now, and also provided some Mulligan and strategy tips. We've also got a breakdown of the fundamental combos - study these carefully before taking this one out for a spin. In future updates, we'll continue updating all areas of this guide. Until then, enjoy this fascinating mish-mash of Priest decks from metas gone by! As Wall Priest continues to be a big part of the meta, we wanted to check in on our deck list at the midpoint of March. We think the lists we've been highlighting remains the strongest version of the archetype, and will very likely remain the established version between now and the launch of Riseo of Shadows next month. If you're completely new to playing this archetype, have a look at Trump's recent video which showcases a few matches very nicely. Here's what we believe to be the best Wall Priest deck list seeing play right now. It's likely to evolve over time, so check back soon in case of meta updates. In general terms, your objective here is to keep fielding your meaty taunt minions onto the board, so as to provide the opponent with a steady defensive wall. Time is very much on your side here, and so it's fine to force them into burning through their removal spells - you have lots of resurrect effects at your disposal, after all. Once you have a preferential target on the board and lethal is in sight, you can then of course boost it with your Divine Spirit cards, before overpowering it with the extra attack strength granted by Inner Fire. Topsy Turvy will also provide the same benefit. 1. Use your taunt minions liberally here as they'll eventually run out of methods to take them all out. Even if they can clear your boards, you always have resurrection cards to bring a target back to life. 2. Outlasting the opponent into the late-game really is the objective here. You have board clear in the form of Mass Hysteria, but you need to survive long enough to be able to make use of it. 3. If an opponent's minion gets dangerously out of hand, consider the fact that you can use Inner Fire to nullify the threat. Topsy Turvy then becomes the spell you need to boost your own minion, so don't waste it. 1. These are ideal match-ups as you have more than enough lasting power to keep up with even the slowest of decks. 2. You can afford to spend a little more time in the early-game looking for extra tools through cards like Shadow Visions. We'll update this section of our guide considerably once we've had more hands-on time with Wall Priest. This should be enough to give you a steer in your first few games, however. 1. Northshire Cleric - Best case scenario is you get to start drawing through your deck for what you need. Worst case scenario this card eats removal - or diverts some early damage from your face. 2. Tar Creeper - A big blocky minion that will prove its worth in just about every match-up. Just keep in mind that you are "polluting" your resurrection options a little bit by putting this one out early. 3. Power Word: Shield - Very much a third-place keep, but this will add some stickiness to a friendly minion, and is often played in conjunction with Northshire Cleric against aggro decks in particular. It's important that you have a solid understanding of all the combos in this deck before trying to climb the ladder with it. - Once you've a minion with high health on the board, you can use Divine Spirit to increase its health pool, then cast Inner Fire to turn that health into raw damage. Topsy Turvy can also be used in this capacity. - Northshire Cleric will draw you a card whenever a minion is healed. That might come from your hero power, or from casting a spell like Divine Hymn. Watch the over-draw potential if casting the latter on a wide board. - Tar Creeper's extra attack is only in effect during the opponent's turn. If you can set the board up awkwardly for the opponent in this regard, consider doing so. - When Eternal Servitude is cast, you'll be able to Discover a friendly minion that died earlier on in the game. - Shadow Madness can be used to pinch an enemy minion with three or less attack for the current turn only. You might be able to boost this up with your combo, or just slam it into another enemy minion so as to thin down the board. - In its most basic form, Lesser Diamond Spellstone resurrects two friendly minions that died earlier. Cast four spells while it's in your hand to increase that to three minions. Another four spells maxes the Spellstone out at four minions. - Master Oakheart Recruits a 1, 2 and 3 attack minion when put out in play. Targets in this deck are Northshire Cleric, Tar Creeper, Witchwood Grizzly, Zilliax and Mosh'Ogg Enforcer.